Veteran cosmonaut Alexander Kaleri took over manual control of an approaching unmanned Progress supply ship Saturday and deftly guided the craft to a smooth docking with the International Space Station at 12:36 p.m. EDT. Kaleri took over using a telerobotic backup system aboard the station after Russian flight controllers aborted an automated approach. It was not immediately clear what prompted the switch, but Kaleri had no problems remotely piloting the Progress M-08M spacecraft to a linkup at the Pirs compartment attached to the station's Zvezda command module. "Alexander, we would like to congratulate all of you with an excellent manual docking," a Russian flight controller radioed. "The range rate at the time of contact, based on our calculations, was 0.067 (meters per second), so you get an 'A' today." "Thank you very much," Kaleri replied. "This was just like one of our training sessions." 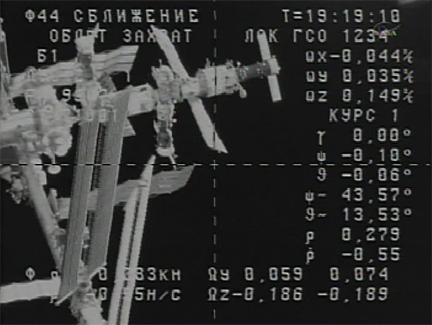 The most recent manual Progress docking occurred last May when cosmonaut Oleg Kotov had to take over after an automated approach was called off. The Progress M-08M spacecraft that docked Saturday is loaded with 2,804 pounds of dry cargo, 1,918 pounds of propellant for the station's Russian maneuvering thrusters, 498 pounds of water and 1,100 pounds of oxygen.